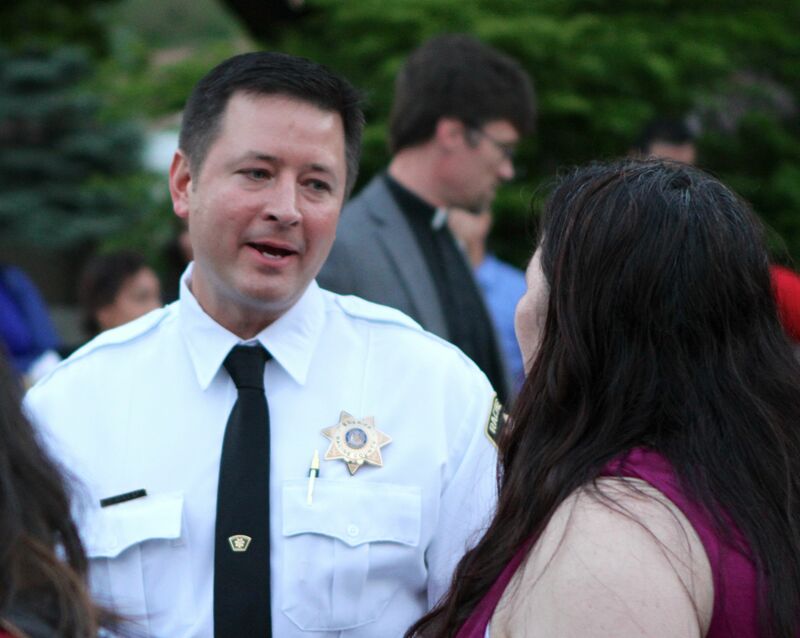 An estimated 400 people showed up for last night’s public forum with Racine County Sheriff Christopher Schmaling and other law enforcement officials. Thanks to cooperation from the weather, we were able to hold the forum outside on the lawn to accommodate such a large crowd. The Racine Journal Times ran their coverage of the event across the front page; Caledonia Patch also highlighted their coverage of the forum this morning. Several persons alleged that they have been pulled over while driving due to racial profiling, which Sheriff Schmaling repeatedly denied was department policy. Both news reports cite the report of 40-year-old Jose Lopez, who said that he was pulled over because he had a rosary hanging from his rear-view mirror. Because he is an undocumented alien, he does not have a driver’s license, but uses his car to get to work. The forum was organized by the Racine Interfaith Coalition in cooperation with the Racine County Sheriff Department, Racine Police Department, and the office of Mayor John Dickert. From Pastor Jhon Freddy: In this paragraph please let us give to the Caesar what belongs to him. Let us write a statement about the Latino community of Emmaus and the leaders of the Latino wider community. If it had not been for the social justice commitment of the Latino ministry at Emaús, this forum would probably not have taken place, or it would been in a different place without such an impressive turn out. So please, let us make sure that the voice and efforts of our Latino ministry and of the leadership of Racine’s Latino community are not silent or diminished.